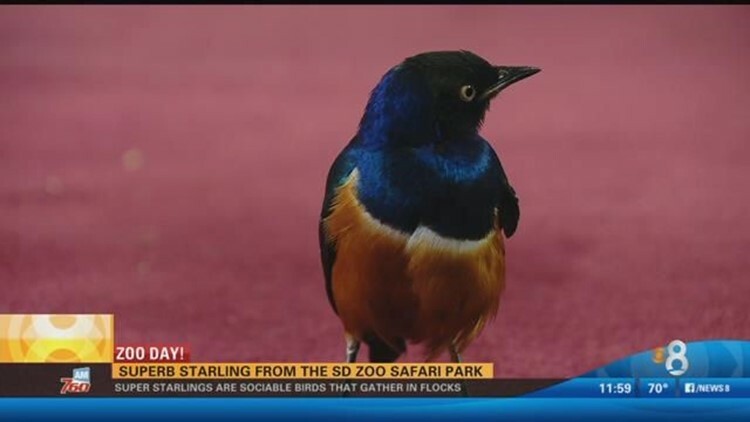 A superb starling was the star of Friday’s Zoo Day segment and for the first time CBS News 8 at 11 a.m. was streamed live on Facebook while being broadcast over the air. Superb Starlings are small, colorful birds commonly found in the woodland areas of East Africa, including Ethiopia, Somalia, Uganda, Kenya, and Tanzania. Adult superb starlings are known for their distinctive colors of metallic greens and blues on its chest, back and wings and duller black on top of its head. The chestnut belly is divided from the dark chest by a stripe of white. These are gregarious birds that gather in flocks that can become quite large after the breeding season, but they also stay in smaller flocks year-round. Superb starlings are monogamous birds that have a hopping courtship display that includes drooped wings and an outstretched neck.